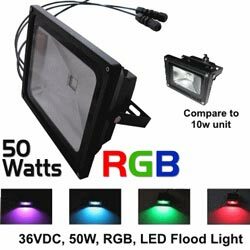 The RGB-Flood-50W is a powerful 36VDC, 50 Watt RGB Flood. It comes complete with internal control board. A weather proof power supply, and weather proof RJ45 connectors to plug this controller directly into your LOR network. This controller also can run in a standard DMX512 universe. No additional parts required to connect this to a LOR network!